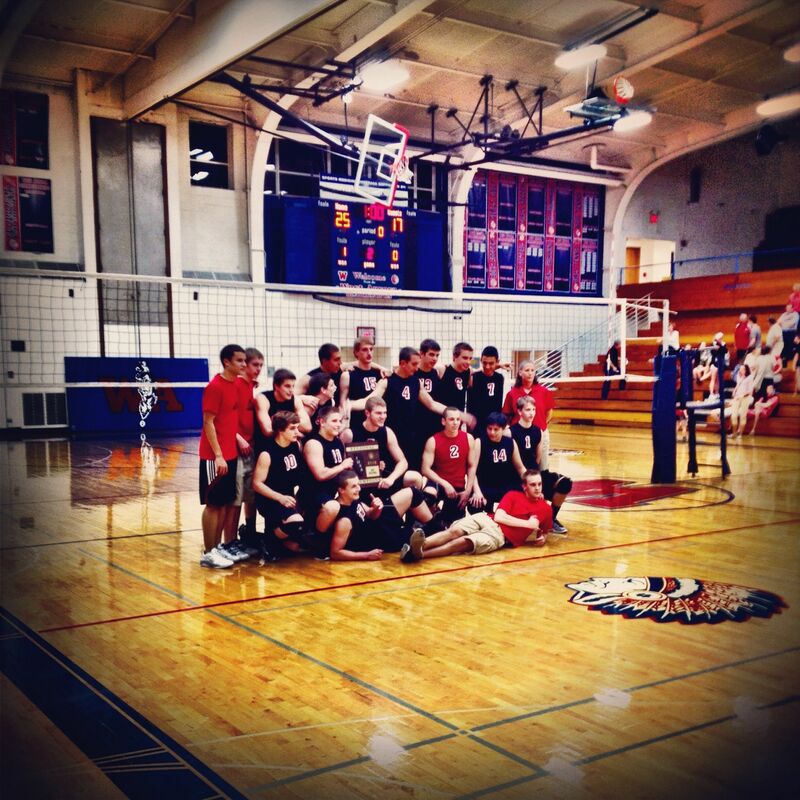 Glenbard East poses with its regional championship plaque. Glenbard East’s play at the net was so dominating during Wednesday’s West Aurora regional final against Downers Grove South, it was as if Joey Farrell, Matt Ploke and Tim Shenkin formed a brick wall over the net. Farrell had 12 kills and two blocks, Ploke had eight kills and two blocks and Shenkin added three kills and four blocks as the Rams knocked off the Mustangs 25-14, 25-17. Glenbard East, the No. 2 seed in the Wheaton Warrenville South sectional, moves on to face sixth-seeded Benet at 7:30 p.m. Friday in a sectional semifinal. The Rams came out of the gate strong, taking a 5-1 lead in Game 1 and never looking back. Glenbard East ended the game on a 7-1 run that featured three kills from Farrell. The junior outside hitter tallied eight kills in Game 1. 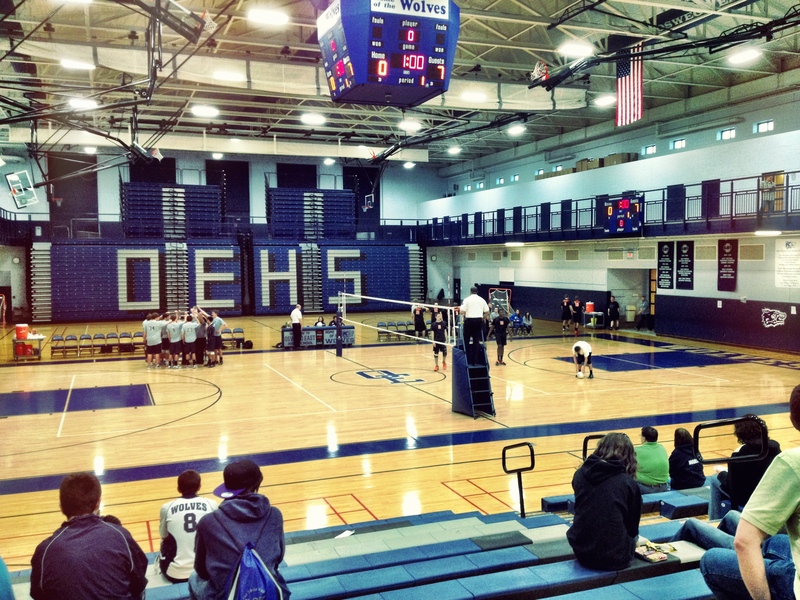 Downers South (25-11) held its only leads of the match early in Game 2, going ahead 1-0 and 2-1. But the Rams took over from there, going on a 7-2 run powered by two kills and a block from Ploke to take an 8-4 lead. 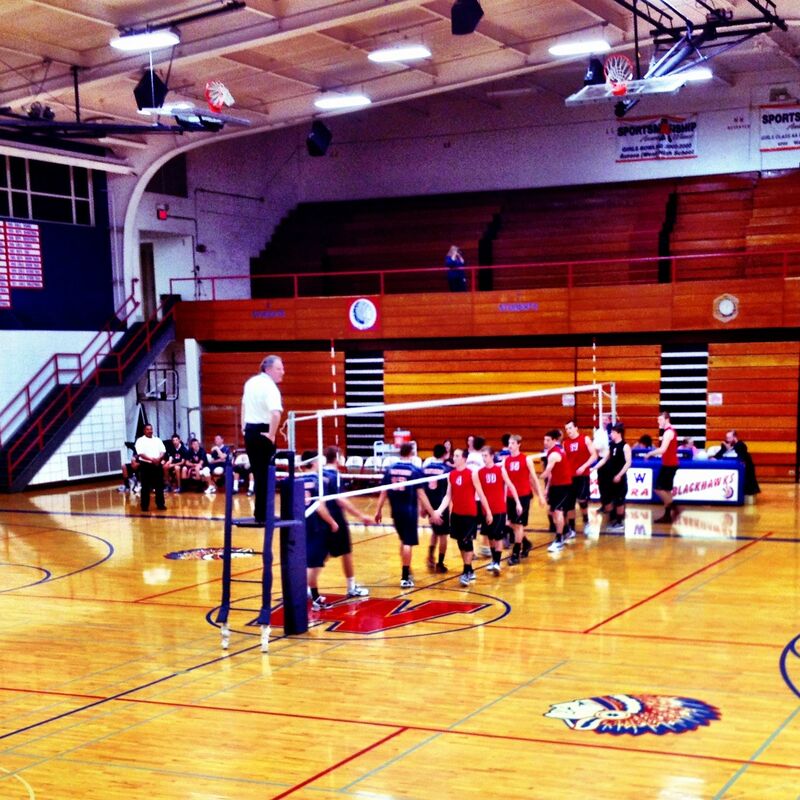 Glenbard East (32-6) would never lose its advantage, going on the win Game 2 25-17. The Mustangs were unable to win more than two points in row during the match. Outside hitter Greg Garro had seven kills to lead the Mustangs. Libero David DeMarco had 11 digs and setter C.J. Blaha added 10 assists. Farrell believes the Rams are playing with the right intensity heading into Friday’s semifinal match against Benet. Downers South lines up for the National Anthem before Wednesday’s game. 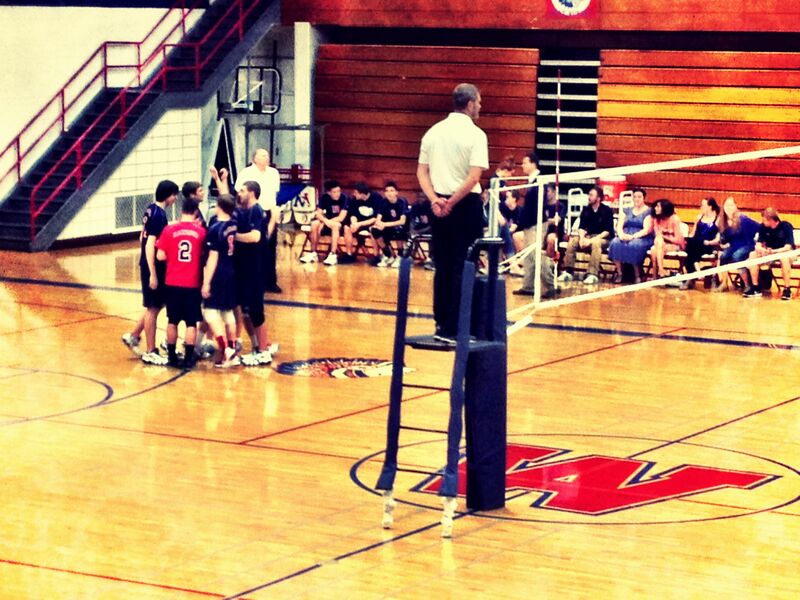 West Aurora wasn’t going to end its season without a fight. The Blackhawks fought off three match points in the second game of their regional semifinal match against Downers Grove South, but it wasn’t enough. On the Blackhawks fourth attempt at extending their season, middle hitter James McGrath’s block attempt landed out off bounds, giving the Mustangs a 29-27 Game 2 victory. Downers South, the No. 7 seed in the Wheaton Warrenville South sectional, won the match 25-22, 29-27 and will face second-seeded Glenbard East Wednesday night at 7 p.m. in the West Aurora regional final. The 11th-seeded Blackhawks dropped a back-and-forth first game that featured 14 ties and four lead changes. After his team fell behind 22-20, Downers South coach Kurt Steuer called a timeout to regroup. The Mustangs responded by winning the next five points and the game. The Blackhawks made four errors in the final five points of the first game, and they carried over that sluggish play into the second game. The Blackhawks fell behind 9-5, but they were able to recover and stage a comeback. After getting within one point seven different times, the Blackhawks finally tied the game at 21-21. Nine points later, West Aurora took its first and only lead of the game, 26-25, on a kill by outside hitter Eric Roggeman. However, Downers South (25-10) sophomore Mike Schmitt stole the show from that point forward. The outside hitter had three kills during the final five points of the match as the Mustangs clinched a regional semifinal victory. Roggeman and outside hitter David Vasquez each had eight kills to lead the Blackhawks. McGrath added five kills and two blocks. West Aurora finishes its season with 23 wins and 13 losses. The Blackhawks won two tournaments and set a school record for regular season wins with 22. West Aurora huddles before its regional quarterfinal match against St. Joseph. West Aurora outside hitter Eric Roggeman set the tone early as the Blackhawks defeated St. Joseph 25-6, 25-16 Monday night in an opening round game of the West Aurora regional. Roggeman tallied two kills and an ace in the first five points of the match as West Aurora shot out to an early 4-1 lead. Later in the game, the Blackhawks went on a 13-0 run that gave them a commanding 18-3 lead. St. Joseph made 13 errors as it dropped the first game 25-6. St. Joe’s play improved in the second game, and after a 7-2 Chargers run, the game was tied 14-14. However, the Blackhawks answered back immediately, going on a 11-2 run to clinch a 25-16 victory. “Today was one of those games where you’ve got to stay consistent. You can’t let your guard down, because these are the teams that sneak up on you and come back when you don’t expect them to,” Roggeman said. Roggeman led the Blackhawks with nine kills while middle hitter Joe Frommert and outside hitter David Vasquez each added five. Libero Patrick Ronan had 11 digs. No. 11 seeded West Aurora will take on No. 7 seeded Downers Grove South Tuesday night at 7:30 p.m. in a regional semifinal game. Koskinaris said he expects a tough battle. “It’s going to be a very good game tomorrow night. I expect nothing less. It’s going to be close, and it’s going to be good,” Koskinaris said. Roggeman said the Blackhawks are up to the task thanks to their tough DuPage Valley Conference schedule. The teams gather on the court pregame for the National Anthem. Waubonsie Valley has made a habit this season of coming back from the brink of defeat. 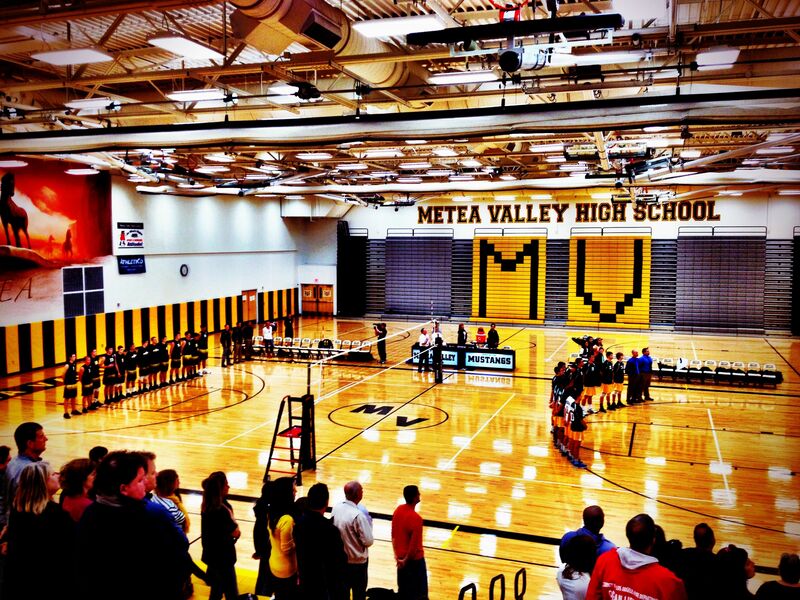 Things were no different on Tuesday as the Warriors fought off five game points in the second game of their 25-23, 28-26 victory over host Metea Valley. 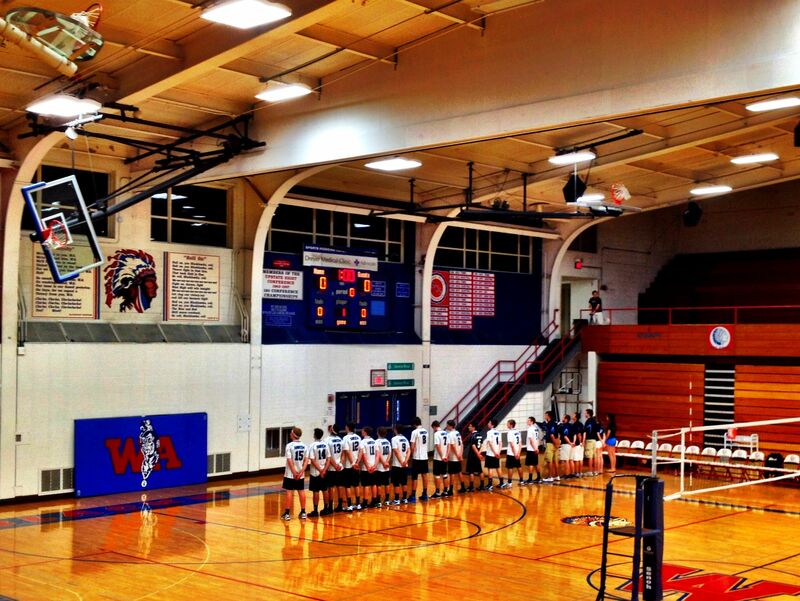 The Warriors had previously come back in matches against Marist and Glenbard West. Waubonsie Valley (24-5, 4-0) trailed 24-20 in the second game on Tuesday before going on a 5-0 run that featured a kill and block from outside hitter Mike Storm. The Warriors then lost back-to-back points, and faced another Mustangs game point – their fifth – at 26-25. Waubonsie came back again to win three straight points, the last coming on an ace by middle Seth Salmon, to win the game and the match. The back-and-forth second game featured 12 ties and seven lead changes. Outside hitter Mike Simmons, who led the Warriors with 16 kills, said the team’s practice routine – with a threat of running – has helped build a never-say-die attitude. Setter Luke Furman had 21 assists, two kills and two aces, Storm had eight kills and an ace and middle Tyler House had two kills and two blocks as the Warriors improved to 4-0 against Upstate Eight Valley competition. Simmons had eight kills in the Warriors’ 25-23 opening game win. After Metea tied the game at 21-21, Simmons had two kills and a block as the Warriors went on a 4-2 run to finish off the game. The 6’6” sophomore’s perfectly-placed tap over two leaping Mustangs on game point gave the Warriors an early advantage. Simmons’ strong play on Tuesday drew high praise from Lagger. Outside hitter Martin Krasuski had seven kills and two blocks and opposite hitter Adam Miller had five kills and five blocks to lead the Mustangs. 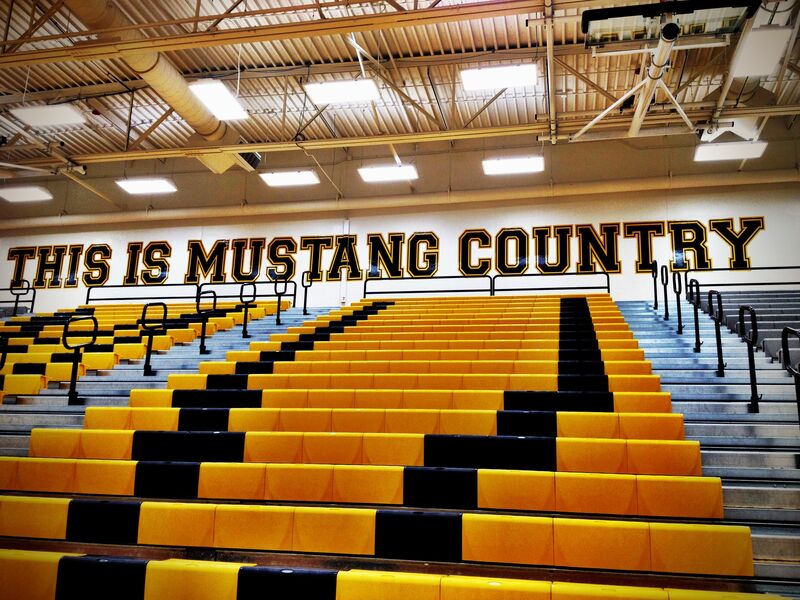 Metea Valley (19-10, 2-4) coach John Aister is looking for someone to step up late in games for the Mustangs. 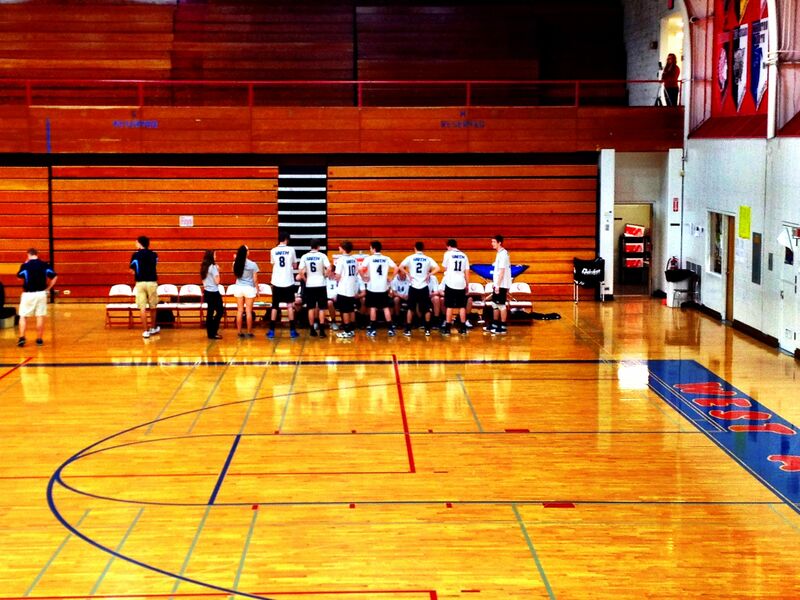 Oswego East huddles during a timeout in the first game of Thursday’s match. 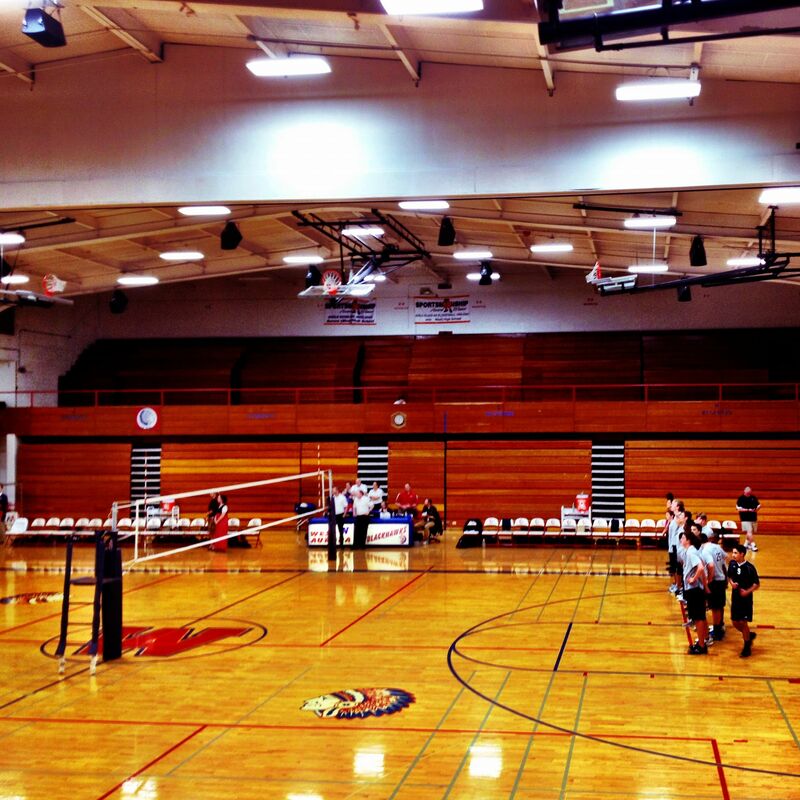 Minooka’s boys volleyball team stood tall as the Indians defeated host Oswego East 25-8, 25-16 in a Southwest Prairie Conference match on Thursday. The Indians, led by 6’9” middle Justin Toth, 6’6” middle Maalik Walker and 6’4” outside hitter Richard Bishop, towered over the Wolves as they cruised to a two game victory. “It’s hard, you’re looking at college teams that are that tall. I was telling my guys to tool the block, because I knew they could block us straight on,” said Oswego East coach Jim Mueller. Walker led the Indians with six blocks and added four kills and an ace. Bishop was the Indians’ kill-leader with eight, while outside hitter Nicholas Vertin added six kills. Toth had two blocks and one kill. Setter Philip Hannon led Minooka (15-2, 6-0) with 19 assists and five digs. Indians coach Janel Grzetich credited the junior for consistently setting up big shots for his teammates. Minooka set the the tone early, shooting out to a quick 9-0 lead in the first game. Bishop had five kills and outside hitter Ryan Bauer had three aces as the Indians cruised to a 25-8 win. The Wolves’ play was much improved to start the second game. Setter Sam Izzo’s ace gave Oswego East (3-12-1, 0-6) an early 5-1 lead. However seven points later, a block by Walker gave the Indians their first lead of the game, 7-6, and Minooka never looked back, winning the second game 25-16. Despite his team’s slow start to the season, Mueller believes the Wolves are not far away from competing with the conference’s best teams. I went a little photo crazy at tonight’s game. Here’s an artsy shot of Oswego East’s fearsome-looking Wolves logo.